Dorob National Park in Namibia incorporates conservation areas of the West Coast Recreational Area of Namibia and multiple areas for adventure tourism. It is a park of great imagination. Dorob Park is stretching from Kuiseb delta south of Walvis Bay to the Ugab River in the north of the country and up to around 50 km inland. Dorob National Park with the Skeleton Coast National Park and the Namib-Naukluft Park with the Sperrgebiet National Park form the Namib Skeleton Coast National Park - the park that stretches along the whole Namibian Atlantic coast. The Namib Skeleton Coast National Park is the largest park in Africa, the sixth largest terrestrial park in the world. The Dorob National Park is an example of smart conservation in Namibia. There are core conservation areas set aside for rare and endangered species, while at the same time other areas are set aside for multiple uses, including adventure tourism, so that the very people who need and want to protect the park aren’t shut out. Windsurfing, kayaking amongst dolphins, quad biking and skydiving are popular coastal activities. The Dorob National Park is inclusive, progressive conservation that aspires to great, grand goals. 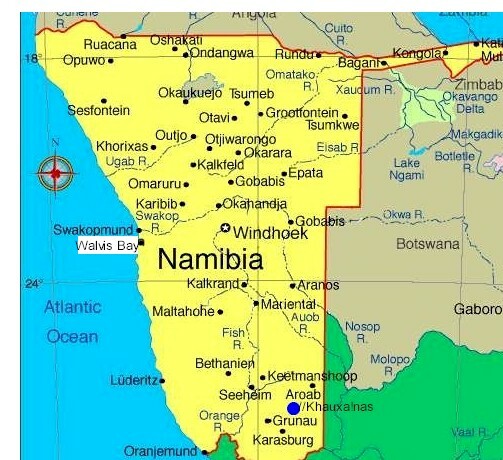 Please note that the blog posted on 24 April on the Dorob National Park is wrong in stating the DNP stretches along the whole Namibian coast. The DNP only stretches from the Kuiseb Delta, just south of Walvis Bay, to the Ugab River in the north, and from the high water mark inland, 30 to about 50 km. The DNP, with the Skeleton Coast Park (to the north of the DNP, the Namib Naukluft Park (south of the DNP) and the Sperrgebiet National Park in the south, form the Namib Skeleton Coast National Park, which is the park that stretches along the whole Namibian coast. This Namib Skeleton Coast National Park is the biggest park in Africa, the 6th largest terrestrial park in the world. Dorob National Park (meaning: "dry land") is a protected area/national park in Erongo, along the central Namibian coast, with length of more than 1,650 kilometres (990 miles). It was proclaimed a national park under the Nature Conservation Ordinance No. 4 of 1975 on 01 December 2010 and with Namib-Naukluft Park covers an area of 107,540 square kilometres (41,520 square miles). The park extends from the Kuiseb River Delta (south of Walvis Bay), north to the Ugab River, and west from the Atlantic Ocean to what was the National West Coast Tourist Recreation Area. Some 75 species of birds flock to the Atlantic coast, with nearly 1.6 million birds recorded at the coast. Before Dorob was declared a national park, as part of the larger intent to create one continuous coastal protected area from South Africa to Angola, it was called the Walvis Bay Nature Reserve under the Cape Department of Nature Conservation. 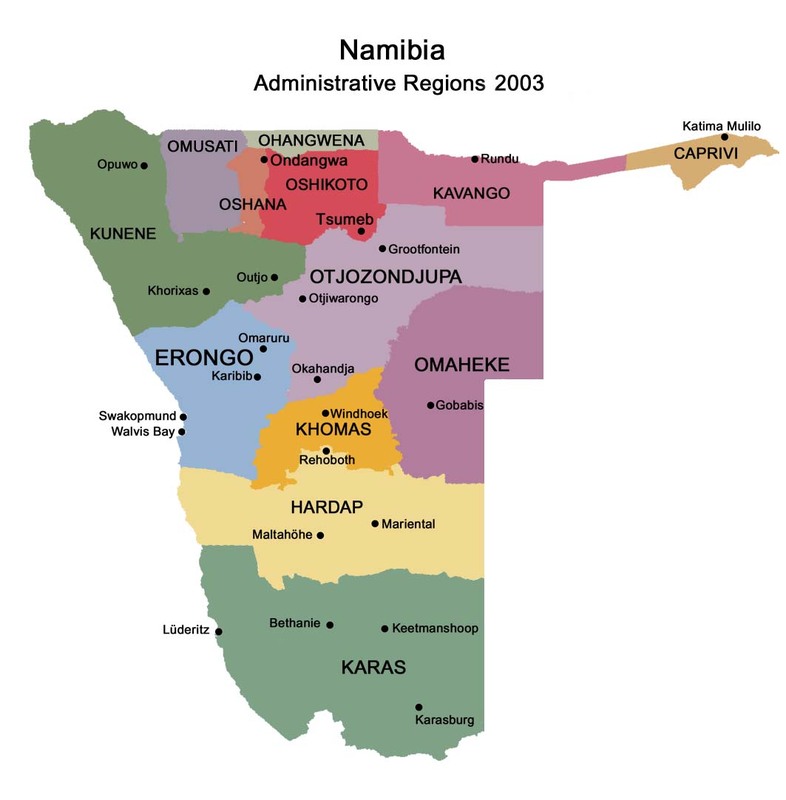 After Namibia became an independent country, the reserve became a part of Namibian territory as part of the Walvis Bay enclave. There was a proposal to name the reserve as Walvis Bay National Park which proved fruitless and finally the central part of the coast area was named Dorob National Park. While the Walvis Bay Lagoon, a Ramsar Site, and the belt of dune and gravel plains that lie between the Swakop and Kuiseb rivers west of the Namib-Naukluft Park are included, Swakopmund, Henties Bay, and Wlotzkasbaken are excluded. Other exclusions are a railway line, certain road reserves of both major and minor routes, some district roads, as well as certain farms. According to National Geographic (June 2011): "with the creation of Dorob National Park in December 2010, the coastline from the Kunene River on the Angolan border to the Orange River on the South African border was an almost solid barrier of parks. All the pieces were in place for what may eventually be designated Namib Skeleton Coast National Park - a single coastal megapark". The TransKalahari Highway passes through the park and there are several mining, fishing, and industrial towns located on this route. It has been alleged that filming in the park in 2012 for the Mad Max sequel Fury Road caused significant damage to the park's habitat. Dorop Park has "a spectacular coastal dune belt, vast gravel plains, Namibia’s richest coastal area for birds, rich botanical diversity, and major ephemeral river systems and their river mouths". The central coast line of 1,650 kilometres (990 miles), which includes the Dorob National Park, is an area of hyper arid desert. Some 75 species of birds flock to this coast, with nearly 1.6 million birds recorded on the coast. BirdLife International has therefore included the park under the category of Important Bird Area. The Damara Tern, (Sternula balaenarum), a species of tern in the Sternidae family, a breeding seabird which is endemic to Namibia is considered a flagship species of the coastal area, and is found in the park, although non-breeding individuals will migrate to the north in winter. Some of the lichen fields are also part of this protected environment. While tourism and sports and recreational activities in (non sensitive areas) are allowed, the basic objective of the National park declaration is to implement conservation measures. To maintain this objective, several laws and guidelines have been framed. The laws are particular to the tourism and sports and recreational activities. It is forbidden for powered aircraft to fly below the altitude of 1 kilometre (0.62 miles) unless participating in the take-off or landing sequence. All commercial, construction, and competitive activities within the park are prohibited, unless the organiser has obtained prior permission in the form of a permit from the Ministry of Environment and Tourism of Namibia. The feeding, containing, hunting, chasing, injuring, or killing of any animal is expressly forbidden, as is the destruction or collection of any object deemed to have "botanical, zoological, geological, archaeological, historical or any other scientific interest". On the management aspect of this unique park the project co-coordinator of the Namibia Coast Conservation and Management (NACOMA) project, Rod Braby, has stated that "The Dorob National Park is managed as a big open system with connections to the marine, coastal and escarpment areas. And the park is managed to prevent and minimize damage to important habitats while aiming for long-term health, productivity and climate change adaptation. As the park is allowed to be used for tourism and recreational purposes in restricted areas only, the park has been divided into zones. The identified zones are: Damara-Tern breeding sites, gravel plains, important birds areas, the Kuiseb Delta, Sandwich Harbour, Swakop River, Tsumas Delta, Walvis Bay Lagoon, birding areas and lichen fields. Dorob is a haven for fishermen with many accessible angling spots along the coast. Species caught include galjoen, steenbras, kabeljou, copper shark (bronzy), cow shark, spotted gully shark, hound shark and blacktail. Please see our fishing trips. Car rental is the best way to reach this coastal park.